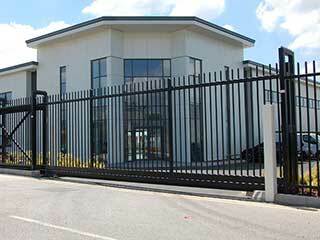 A functional automatic gate system is an essential part of any business; at least any business that has one. Without a reliable mechanism, you’ll struggle to control the access and departure of customers and employees. As a result, deliveries and shipments can be delayed, while visitors and workers can find it hard to get in. Even if the automatic gate still moves, an unreliable system can be both a safety and security concern. A gate that doesn’t keep out intruders leaves your premises vulnerable, so it’s essential to have any problems with it fixed as quickly as possible. Our team offers the fast, reliable repair services that you need, and can cover any problem, big or small. Because all these automatic systems work differently, there is a wide range of issues that can arise. For instance, a sliding gate requires strong, smooth-running wheels to allow easy movement along its tracks. If either the wheels or the tracks are damaged, this can cause severe problems. However, swing-style gates can develop problems with their hinges, an issue that other types don’t have. This makes automatic gate repair a very varied and challenging task that should be left to professionals. If your intercom system isn’t working properly, it doesn’t matter whether your gate can move or not. You’ll be unable to control it remotely or to at least communicate with whoever's waiting on the other side. Our technicians are familiar with a comprehensive range of these systems and can provide expert repairs and replacement parts for any malfunctioning unit. Our team here at Gate Repair Encinitas understands how important a system that's able to work reliably is to a business, which is why our technicians always put an extra effort into every job their asked to perform. Our same day repair service policy guarantees our experts will get to you as quickly as possible, and apply the most effective solution to the problem you're dealing with.